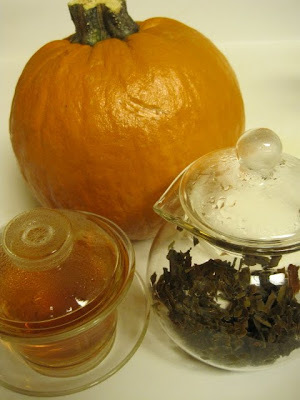 The exact tea Michael Harney lists in his book is Okayti DJ 480 Autumnal FTGFOP, while the tea I was ultimately able to find was simply "Okayti" from Stash Tea. 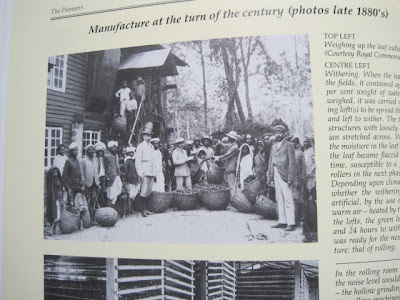 Harney explains that the DJ 480 in the name means this tea is a Darjeeling from the 480th lot to be harvested that year at this particular plantation. Over the years I've observed all sorts of tea packaging, but this Stash Tea package had an interesting way of opening. If you look at the top right corner of the bag, you'll see a punched out hole with a little "tab" you pull to open it. 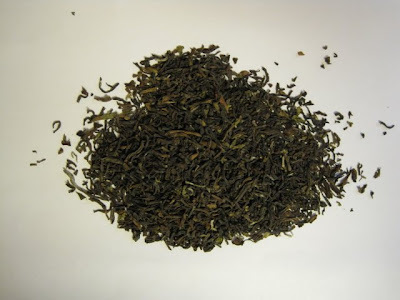 Dry leaf appearance: Longish tea leaves that were mostly dark brown, but with a few lighter brown leaves mixed in. Wet leaf appearance: These tea leaves seemed to open to full leaf size pretty quickly. Steeping temperature and time: 1 teaspoon of tea, 190 degrees, 4 minutes. 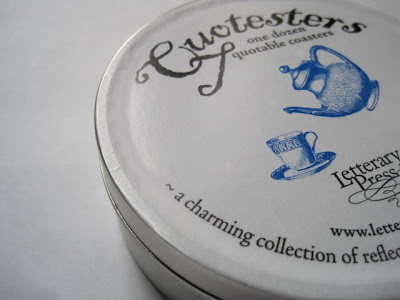 Scent: As with another recent Darjeeling, this dry tea smelled of a mix of freshly cut wood and freshly painted paint! It's a very fresh, woodsy smell that I really like. Steeped, this smelled like a roasted tea with a pleasantly fruity finish. Flavor: At first cup, I thought this was a pretty good cup of tea, with a nice traditional Darjeeling taste but a bit of astringency. Because I happened to be home all day on the particular day I tried this tea, I made another cup, and then another, and then another. To my surprise, the taste just got better up until cup five, when things started to weaken a bit. 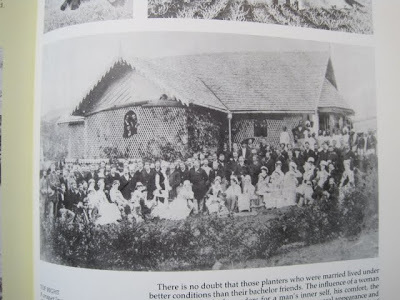 Additional notes: Michael Harney shares a tale I've heard before, that Queen Victoria "found teas from this garden enjoyable" and "pronounced that it was indeed 'okay tea.'" The A Tea C's are here! 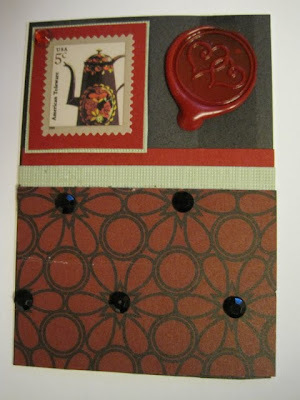 Several weeks ago I wrote about ATC's, or Artist Trading Cards, which are simply 2-1/2 by 3-1/2 inch pieces of art. 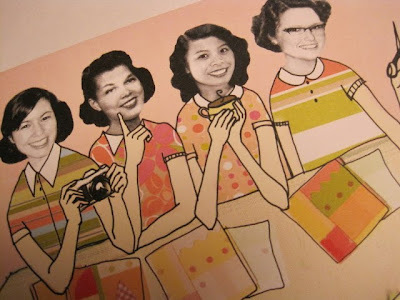 A number of you good ladies humored me by signing up to swap tea-themed ATC's, or A Tea C's, as we call them here. Although I didn't get my cards in the mail to her until yesterday, my swap partner Lynn's cards arrived several days ago, and I was thrilled! Isn't this card lovely? That's just my color palette with the pinks and greens in the ribbon. 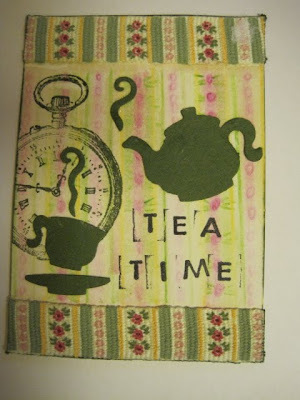 I also like how she stamped a clock image since the card is titled Tea "Time." Love it! 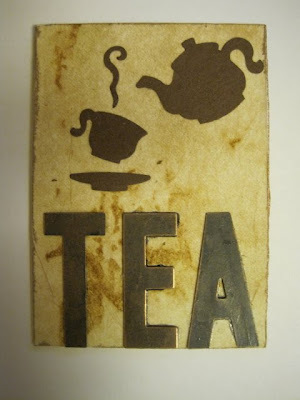 She made the second card with a totally different look, with teapot and teacup punched silhouettes plus large metal letters spelling "TEA," and the background is some cool textured paper. She even inked the edges! 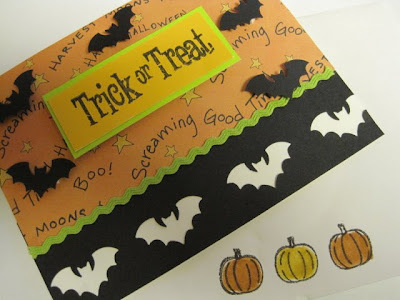 It was an extra treat that Lynn enclosed a card from popular crafter/artist Claudine Hellmuth, whose work I admire. I love the sweet smile on the face of the lady holding the teacup! 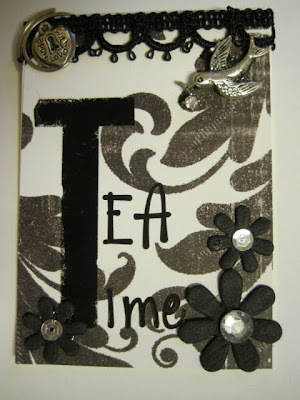 And this "Tea Time" card looks so elegant with its black and white color scheme, doesn't it? Sparkly rhinestones and silver charms are another nice touch, and the black trim looks like tatting! The result, I must say, was delightful! My husband enjoyed some of this spread on a cracker and said "Hey, write that one down!" So I did. I've had this on whole grain bread for lunch (excellent), on a bed of lettuce (ditto), and then it occurred to me this would be a great meat salad to serve in phyllo cups at my next tea party. 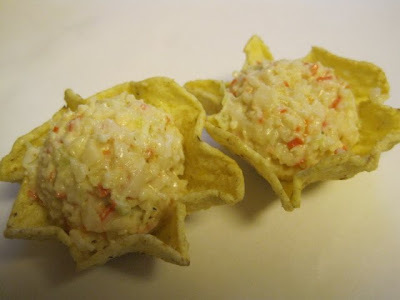 I didn't have any phyllo cups on hand, but I did have some Baked Tostitos Scoops to show the effect. And if you're looking for an easy appetizer for holiday serving, I think this could work there as well. I love recipes that are versatile! 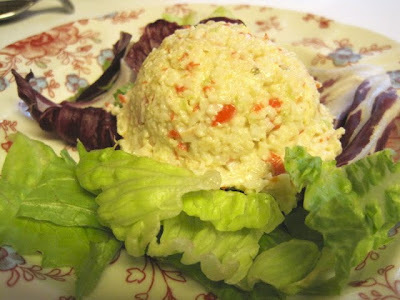 Place crabmeat chunks, celery stalks and cheese (no need to grate it) in bowl of a small food processor and pulse just until pea-size chunks appear (or finer, if you like). The Habanero cheese, even this small amount, gives quite a bit of kick to this recipe. Pour into mixing bowl and add lemon juice, parsley and paprika. Add just enough mayonnaise to make it hold together and combine well. Yields about 2 cups of spread. Recently I was wandering the internet in search of stationery. Although I have quite a few tea-themed notecards, whenever it's time to send a non-tea-related, grown-up looking notecard, I find myself running to the store to the tune of $3 to $4 a card. It was time to order some decent stationery, and I ended up getting some simple pink embossed notes with a monogram on them. But oh, have you ever seen handmade letterpress stationery? If I had about $700 to blow I would have some on the way, but alas, I continue to have Darjeeling taste and a Luzianne pocketbook. 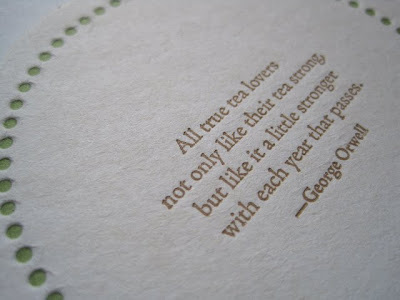 Which led me to browse Etsy for letterpress items, where I found the most unique tea item I've come across in ages! 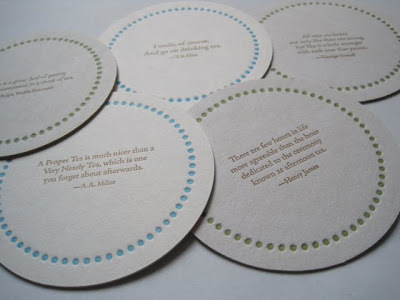 These "Quotesters" are letterpress coasters printed with quotes about tea, some of which I've never heard before. Etsy always surprises me with the great hidden talents who've opened a shop there, and I have already begun Christmas shopping (browsing, at least) on Etsy. Letterary Press (don't you love the name?) is obviously a thoughtful woman who produces beautiful and unique items. I believe it was in the old Victoria magazine I first learned about letterpress, a type of relief printing made with a press and movable type, made one impression at a time. Can you see how the impression sinks deep into the paper coaster? But I must confess: These coasters are far too pretty to let drippy drinks rest upon, so I'm going to use mine as elegant bookmarks! 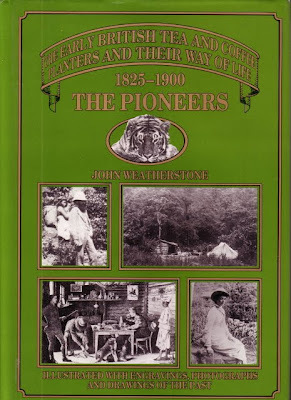 Over the past week I read the most fascinating book about the early tea planters called "The Pioneers: The Early British Tea and Coffee Planters and Their Way of Life 1825-1900" by John Weatherstone (Quiller Press, London, 1991). I was expecting an interesting but somewhat dry historical account. Instead, I found myself reading this like it was the latest blockbuster novel, filled as it was with adventure and mystery and unexpected plot twists! 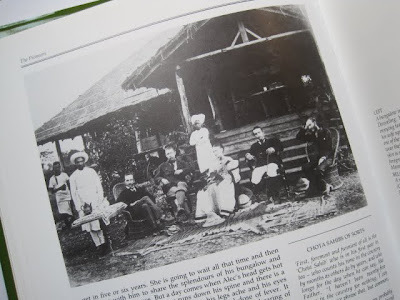 Weatherstone, who was himself a tea planter in Ceylon, gives a brief account of how the Brits first acquired their tea from China but in 1823 learned the tea plant was growing wild in the jungles of Assam. 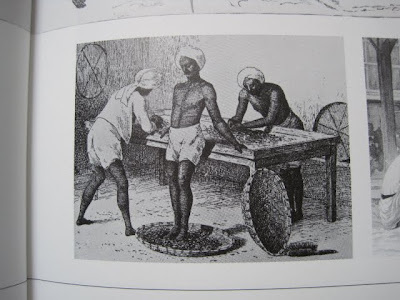 A few years later, a "tea committee" was set up to investigate the possibility of growing tea commercially in India. 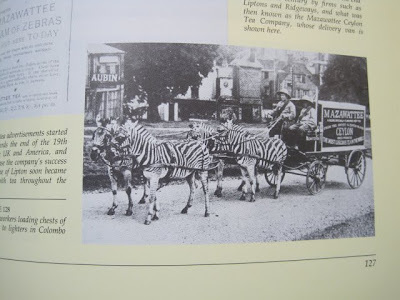 The book includes more than 300 photos and illustrations, and I learned a great deal just from reading the photo captions. For instance, I knew that tea pluckers tossed the tea leaves in baskets, but I'd never given a moment's thought to how that tea was packaged and transported back to England. 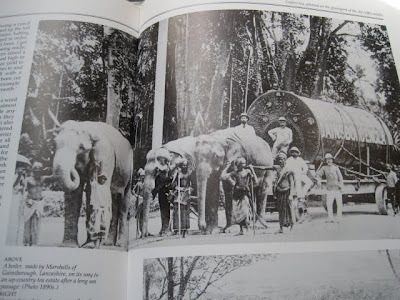 I have much more respect for that hard work after reading and seeing illustrations of how workers had to chop down trees, haul the trees to the tea garden via elephant (! ), build their own boxes from the wood and then package the tea for the next leg of its journey. And since I need to wind this up, I'll just share a few of the photos I enjoyed in the book. 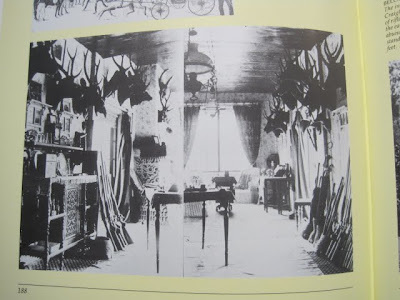 Here is the interior of one tea planter's dwelling, a fellow who obviously enjoyed hunting. 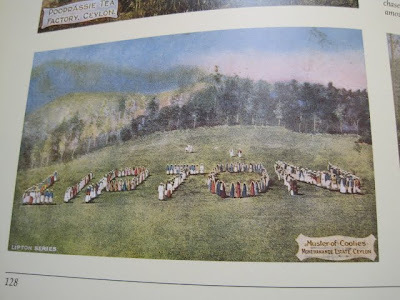 A postcard series from Lipton showed a "Muster of Coolies" spelling out the name of their employer in Ceylon. And finally, I was amused by the Mazawattee Ceylon Tea Company's promotional efforts. Wouldn't you do a doubletake if this "delivery van" showed up with your tea in tow! And I'll leave you with one final quote from Weatherstone's fascinating book: "It is doubtful whether we who live in the 20th-century comfort of our homes -- with nothing more than a tame cat roaming around in the garden, with instant light at the touch of a switch and water at the turn of a tap -- can possibly imagine the lonely and often dangerous life of these first planters whose courage, endurance and fortitude in the face of all adversity made them what they were ... the pioneers." 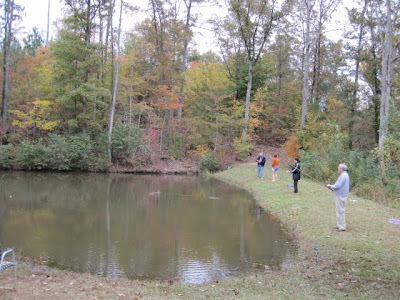 Over the weekend I enjoyed an afternoon of fishing and then a fish fry at my parents' house. The weather cooperated and we enjoyed quite a few sunny stretches. The leaves are beginning to really change colors, and it was great to have such a lovely backdrop to the afternoon. 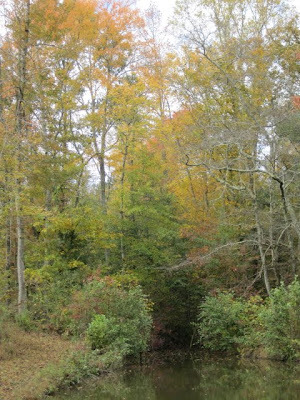 I like how the lake winds up in this cove with an archway of trees overhead. 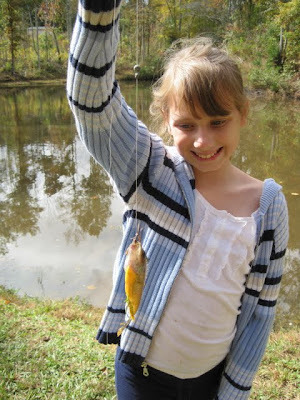 I caught only one little fish, so small it had to be thrown back (and yes, my husband had to bait the hook since I don't do worms), but I must say my nieces did pretty well (in order of appearance, that was Madison, Cari and Amelia). 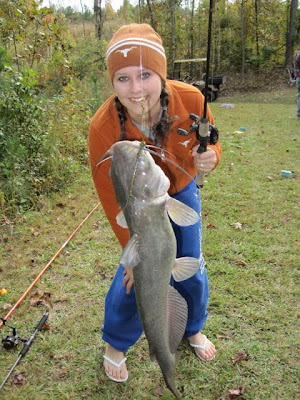 If fish and fishing aren't your cup of tea, perhaps these will be! My contribution to the evening's meal was dessert, these Caramel Apple Cupcakes from a recipe I found online when I was researching cupcakes for that wedding baking project a few weeks back. 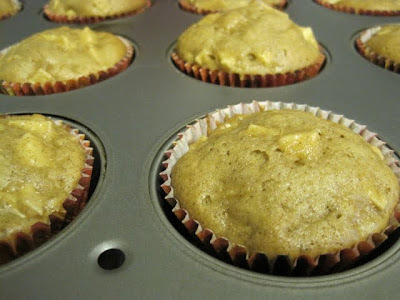 With tart Granny Smith apples, cinnamon, and a cream cheese frosting flavored with maple syrup, these are the perfect fall cupcakes to me! 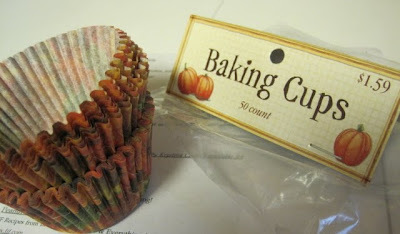 First, we have fall baking cups from Hobby Lobby. 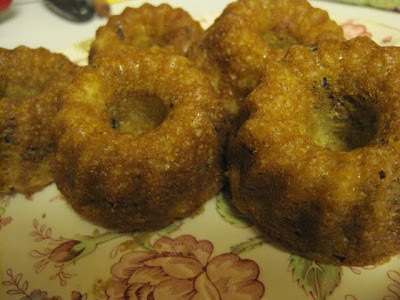 Using this recipe, I chopped up some Granny Smith apples and prepared the thick, lumpy batter that resulted in these. Once frosted, I had to pop one of these in a miniature glass stand to see how it fits. Perfect! 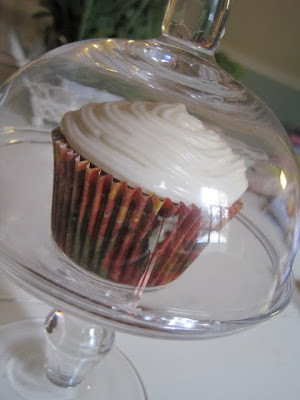 And although we had iced sweet tea with our fish supper that night, I paired my cupcake with a cup of hot Keemun Mao Feng tea. 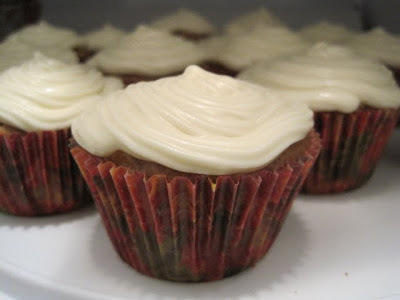 I thought anything with cinnamon or even maple flavoring would compete too much with the flavor of the cupcakes, and the Keemun was a terrific fit. I think "caramel apple" (the flavor as well as the caramel-covered fruit) is my favorite fall flavor, followed by maple and then cinnamon. Do you have a favorite fall flavor? 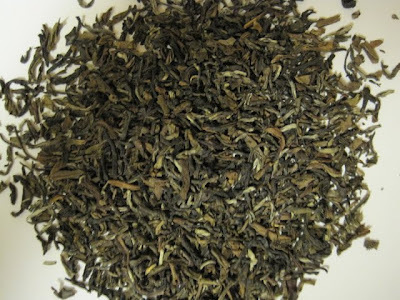 Dry leaf appearance: Tightly rolled leaves ranging from near black to dark brown, light brown, some greens and almost white. Wet leaf appearance: Chopped green/brown with what looked like quite a few twigs floating around. Curious, I fished a few out of the bottom of the pot and realized they were simply leaves so tightly rolled they had never unfurled! Steeping temperature and time: 1 teaspoon of tea, 190 degrees, 4 minutes. But that was wayyyyy too strong a brew for me, so I tried it again at 2-1/2 minutes. Much better. Scent: The dry tea smelled like wood shavings. 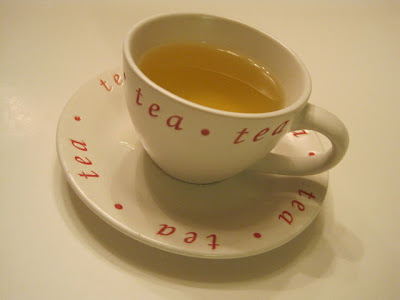 The steeped tea reminded me of steamed vegetables with a slightly sweet finish. Flavor: On just a few occasions this year, I've sampled a tea and recognized immediately that its too-strong taste was the tea maker's fault and not the tea's. Such was the case with this one. The first cup I made with the 4-minute steeping time tasted like double strength tea. The second, 2-1/2 minute steeping time was just about as strong as I like it. 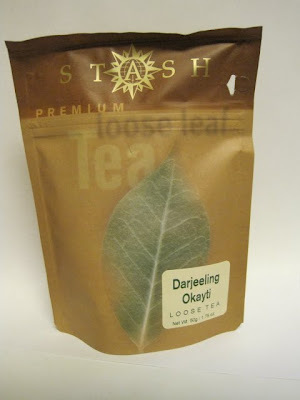 A nice traditional Darjeeling taste with a pleasant aftertaste, and only slight astringency. Additional notes: Michael Harney says this tea is actually from Nepal, not Darjeeling, but it's made in the Darjeeling style. "Himalayan Tips comes from a promising new garden started just a few years ago called Jun Chiyabari," Harney says. "A small operation about thirty miles west of the border, Jun Chiyabari supplements its own leaf production with leaves from other local Nepalese tea farmers." Yesterday the DH worked from home, and when I came in from work he told me he'd had to sign for a package for me, a package from Singapore. 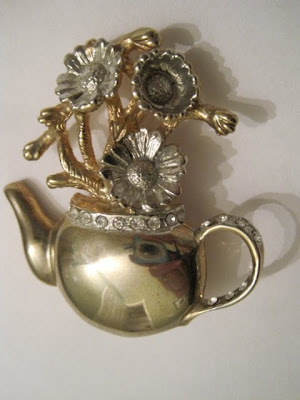 I was pleasantly surprised to find that a brooch I'd found from an Etsy seller in Singapore had arrived so quickly. (And I'm not complaining, but $4 for shipping from Singapore to Georgia seems like a mighty fine deal to me!) The pin is about 1-3/4 inches tall, and I love that even though it has rhinestones (even UNDER the handle, which is a nice touch), it isn't really that gaudy. 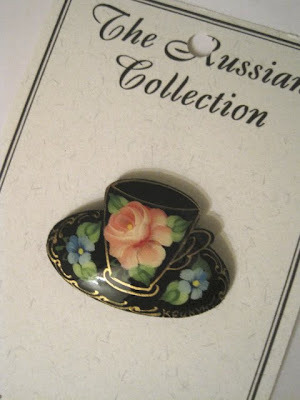 Also in the day's mail was the only thing I've found on eBay in the last month, a beautiful little (1-1/2-inch wide) Russian teacup pin which will look great on the new black coat I bought the other day. The seller is actually in Illinois, but the pin is said to be a genuine Russian hand-painted wooden piece. It reminds me so much of a similarly painted pin I got from my grandmother, and I have to say I just adore the design of the piece, the pretty shape and the pink rose. If nothing else, my geography skills are improving as I add to my tea-themed jewelry collection! Almost every time I go to my mom's for a visit, she sends me home with some kind of thrift store or garage sale treat she has picked up. 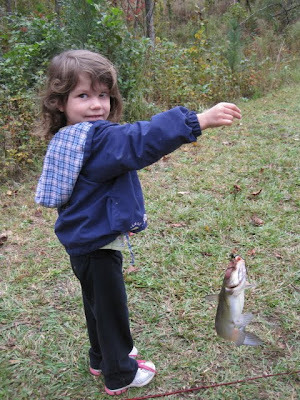 (She does this for my sister and my nieces and nephew, too.) One of Saturday's treats was this teacup - literally a "tea" cup! But the yummy Maeda-en wasn't the only tea the USPS delivered. 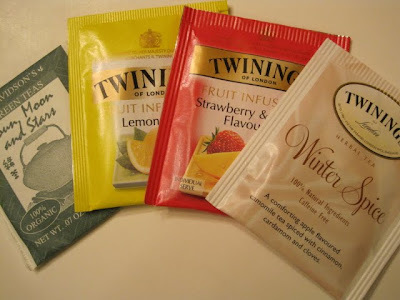 There are also samples of tea from Davidson's (Sun, Moon and Stars) as well as some Twinings teas (Winter Spice, Strawberry and Mango, Lemon Twist). All are new to me, and I will so enjoy savoring them in the days ahead! One of the nice things about my job is that it *requires* that I read a lot of magazines in search of new editorial and design ideas. I eagerly await the arrival of each year's Christmas magazines, and this year's issues are some of the best yet. In recent years the trend seems to be for well-known magazine brands to publish special Christmas/Holiday issues in addition to their regular monthly or bi-monthly issues. 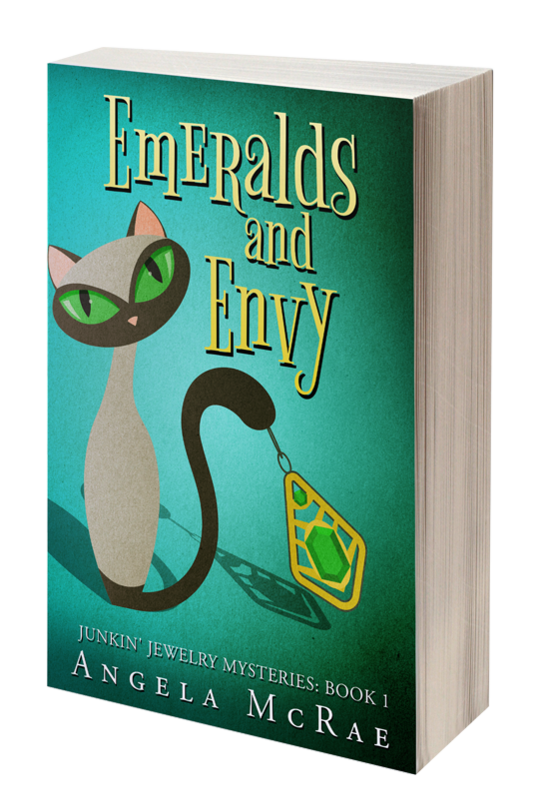 They feature thicker paper stock and a higher price tag, but the quality makes them worth it. 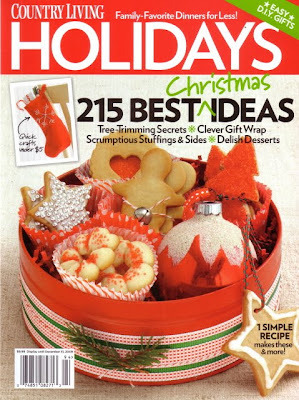 Country Living Holidays ($9.99, 122 pages) is brimming with good ideas, from do-it-yourself candles in teacups to beaded snowflake ornaments and Chocolate Bark made with something called cocoa nibs. If you're planning a Cookie Exchange, you'll be happy to see such recipes as Cranberry Pinwheels, Ginger-Marmalade Thumbprints and Chocolate Chip Shortbread. You'll find recipes for cooking the turkey AND the ham, and there are giftwrap and decorating ideas galore, all served up with the beautiful photography we expect from Country Living. 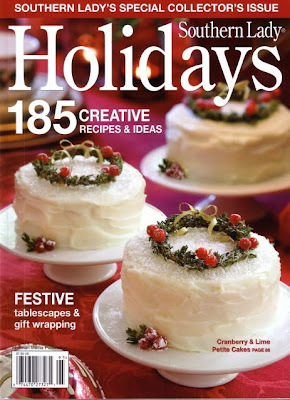 Southern Lady Holidays ($7.99, 132 pages) is a special issue from Hoffman Media. 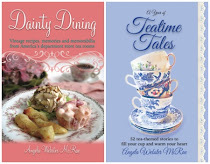 The cover's color palette is very similar to that of the new Tea Time, red with white-hued foods. 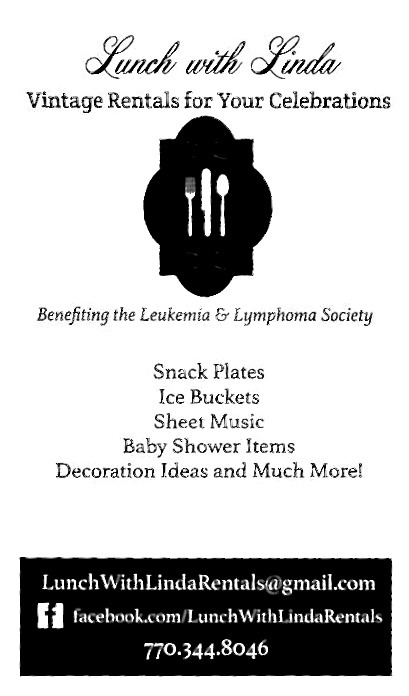 I especially enjoyed the giftwrap ideas (though I'm not sure I'll tuxedo pleat or accordian ribbon anything this year!) and the elegant black-and-white table setting featuring silhouettes. As a fan of both Barbara Randle (the colorful crazy quilter) and the MacKenzie-Childs company (which makes colorful furnishings and home decor), I must say I was quite smitten with the colorful Christmas table setting styled by Randle. (Yes, I'm the magazine nerd who flips to the back of the book and reads the credits. "That looks like Barbara Randle's work" and then "By George, it *is* Barbara Randle's work!") 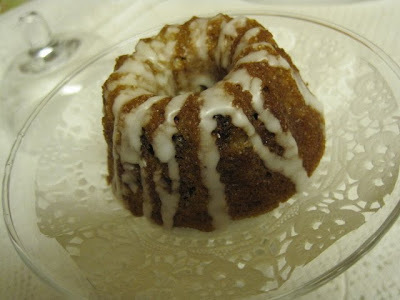 There are also some good recipes to try, including several that would be perfect for a Christmas tea or luncheon. 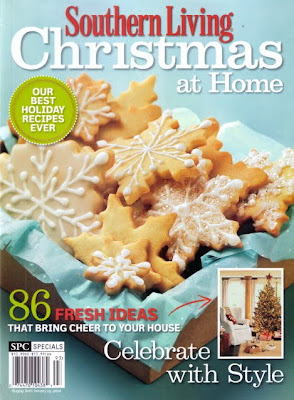 Finally, my favorite "special" Christmas issue so far this year is Southern Living Christmas at Home ($10.99, 114 pages). Now here's a bit of magazine trivia for you: When we editor types go to conferences, the "experts" are always telling us to put numbers on our covers. If you look at all three of these covers, they all have numbers on them. I did not realize until just now that the magazines boast 215, 185 and 86 ideas, respectively. (The "experts" also say to make it an odd number, not an even number, so I'm heartened that Southern Living went all renegade on the matter.) But seriously, have you EVER bought a magazine because it had "x" number of ideas inside? I never have. I always flip through a magazine first, and generally if it's got one or two things that grab me, I'll buy it. But I digress ... What I love about this issue is the great variety of styles of Christmas decor. There's organic (wrap presents in burlap! ), glamorous (flock your tree and decorate it with Tiffany blue beads and ribbon! ), natural (make angels from pinecones!) and more. The recipes are great, and I predict I won't make it through Christmas without succumbing to the desire to make Snowy Chocolate Baby Cakes, which are inverted muffin-sized cakes topped with icing and red berries in imitation of Christmas puddings. And if YOU come across a terrific Christmas issue, I'd sure love to hear about it! I definitely feel a tea party coming on. I often find my mind wandering to invitations and linens, recipes and -- best of all -- friends I haven't gotten to spend time with in a while. 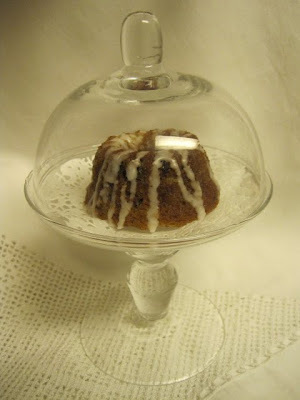 And I cannot wait to use these adorable miniature glass domed stands I found at Hobby Lobby last week, just begging to serve up treats for special friends. 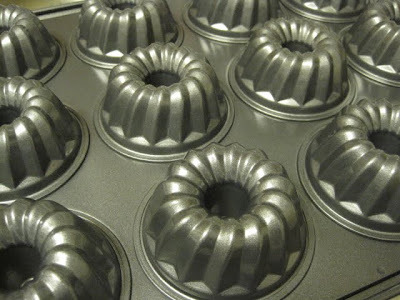 At just 7-1/2 inches tall and 4-3/4 inches in diameter at the widest part, they're big enough for only a cupcake or a mini Bundt cake, like the ones I made last night! I can think of lots of uses for these (I got 4) when not using them for teatime purposes, such as displaying small collectibles or jewelry or Christmas ornaments. If you happen to have the Christmas issue of Tea Time magazine, I halved the Winter Quick Bread recipe on page 24 (and added 1/2 cup of dried cranberries just because I like 'em). I also drizzled a little icing (powdered sugar and milk) for aesthetic purposes. The cakes themselves were quite yummy, and so small, about 2-1/2 inches in diameter, I didn't feel at all guilty for eating one. 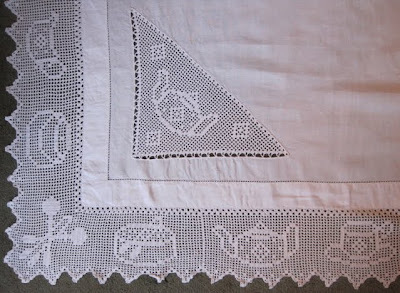 When I was plundering through some linens over the weekend I realized I had never told you about my very favorite teatime tablecloth, which has a bit of a story behind it. 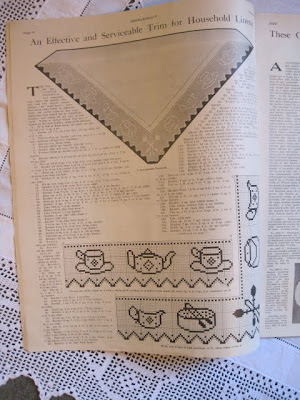 It began about a year ago when I was violently outbid on eBay for another tablecloth featuring this same design. I was willing to go maybe $20-something, but alas, it went for well over $100! 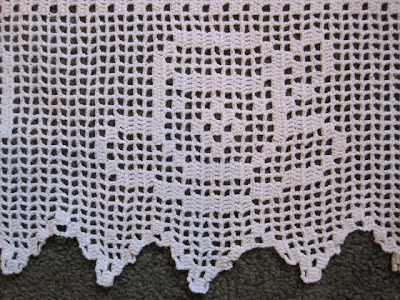 I had really fallen in love with the lovely white tablecloth and was so disappointed not to have won it, but that's the way the cookie crumbles sometimes. 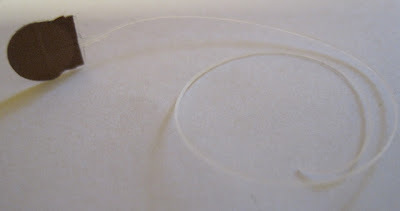 ... "An Effective and Serviceable Trim for Household Linens." 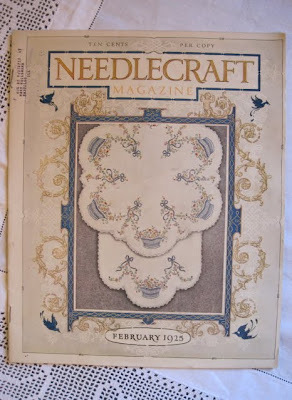 I love old needlecraft magazines! Meanwhile, I was trolling Etsy late one night and lo and behold, there was the longed-for tablecloth for $28 from a seller in Ontario, Canada. 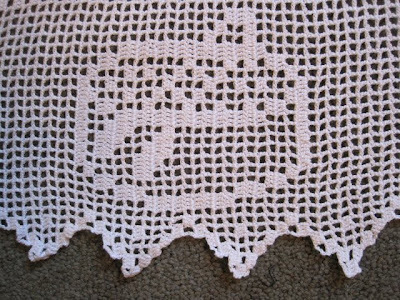 It was in absolutely perfect condition, and furthermore, although I *could* have crocheted the edgings myself, it would have taken me forever. 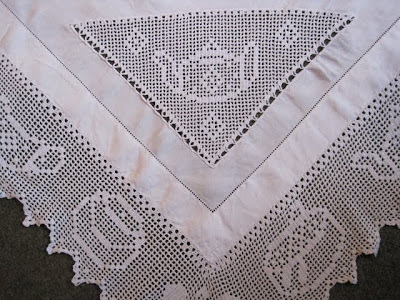 Plus, my sewing skills aren't anywhere near as precise as would have been needed to stitch together this lovely cloth. So I broke one of my own rules and bought something I could have made -- and I've never regretted it! I like that it features teacups and teapots so prominently. And even a sugar dish with sugar tongs! Sweet! 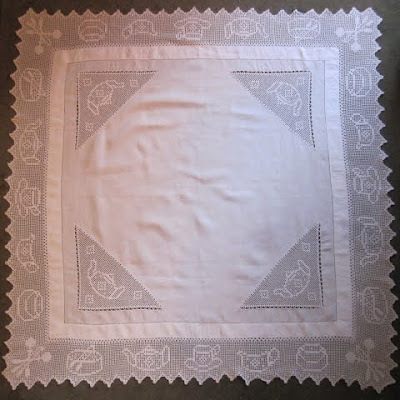 The cloth is about 40 inches square, and it is definitely my most prized teatime tablecloth! 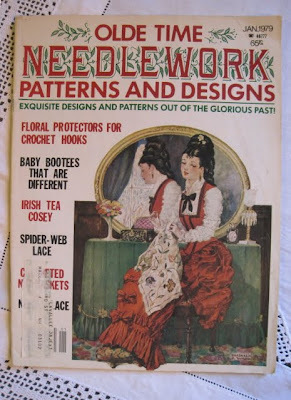 *NOTE: Since I now have two copies of this crochet pattern, I would very much like to place one of them, the one in the 1979 Olde Time Needlework magazine, with a good home. Be the first one to leave a comment saying you could use it and it's yours! A Tea C swappers selected!